Toner Ink Online. 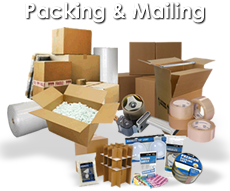 Printer, labeller, typewriter, till and card machine supplies. Paper, office supplies and data storage. We supply ink cartridges for all the major printers including original manufacturer's ink from HP, Lexmark, Epson, Canon, Brother, Dell and more. In addition to our genuine, original ink cartridges we also offer a wide range of compatible inks at a lower price than the originals as well as high capacity inks from both the original manufacturer and compatible alternatives. We are a retail shop based in Heckmondwike situated between Leeds, Bradford, Halifax, Wakefield and Huddersfield in West Yorkshire. We have been established for over 20 years and have grown to be one of the foremost suppliers of quality printer consumables in the area offering the convenience of both online orders for next day delivery as well as same day collection from the shop if you need ink fast. Using this website you can quickly and easily order items online, pay by credit card using our secure payment system, and administer your orders and your account details from your own secure login. We supply toner cartridges, ink cartridges, ribbons, fax films, fuser units, drum units, print heads and other maintenance items for all the major laser printers, inkjet printers, dot matrix printers, photocopiers, plotters, fax machines and multi-function devices. We stock a wide range of original cartridges, ribbons, films and maintenance items from HP, Lexmark, Epson, Canon, Brother, Ricoh, Dell, Gestetner, IBM, Infotec, OKI, Kyocera, Toshiba, Utax, Xerox and more. In addition, we offer a large range of cheaper compatible ink and toner cartridges, ink ribbons, rollers and films and maintenance items. We supply a large range of stationery including paper, envelopes, binders, diaries, office equipment, calculators, file folders, presentation supplies, pens, pencils, organisers, planners and much more. 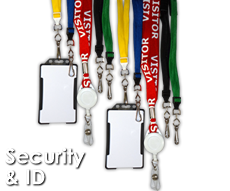 Our diverse range covers your needs whether they are for home use or business, such as schools, office, hospitals or government/council. There is no minimum order so whether you need a single pen or several reams of paper, we are happy to help. 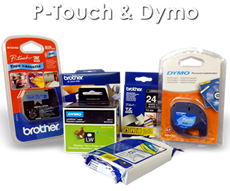 We supply an extensive range of Brother P-Touch and Dymo supplies from labels and laminated tapes to the label printers/devices themselves. For Brother P-Touch we stock DK labels, HG tapes, M tapes, ST stencil tapes, TC tapes, TX tapes and TZ tapes. Our Dymo range consists of D1 tapes, D2 tapes, Labelwriter labels, Letratag labels and Rhino tapes. We stock supplies for Point of Sale/Point of Purchase (POS/POP) devices such as tills/cash registers, credit card machines, mobile payment terminals, time clocks and adding machines. 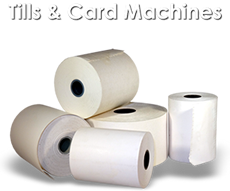 These include thermal rolls and paper rolls of varying sizes, fax rolls, ribbons and ink pads as well as adding machine devices themselves. 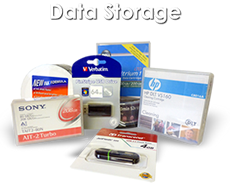 We supply a wide variety of data storage media for use in cameras, personal computers, mobile phones/tablets and more. These include blank CDs/DVDs, data tapes (DLT, TR, Ultrium LTO, Dat DDS, DC, SLR, MLR), floppy disks, dictation cassettes, Iomega Jaz/Zip disks, Secure Digital (SD) memory cards, SDX /AIT data cartridges, ADR Onstream tape cartridges and USB memory sticks. 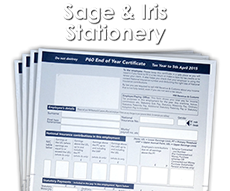 We supply Sage, Iris and Pegasus compatible stationery. 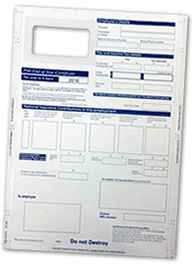 These include P60 End of Year forms, credit notes, payslips, invoices and statements. We also offer quantity pricing on many items for savings on larger orders. 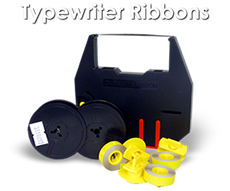 We supply a range of typewriter ribbons and accessories for all the major manufacturers such as Accrodyne, Brother, Canon, Casio, Empire, Hermes, Imperial, Olivetti, Olympia, Panasonic, Philips, Royal, Samsung, Sharp, Silver Reed, Smith Corona, Triumph Adler and more. This includes ribbon spools, correctable ribbons and lift off tapes from both the original manufacturers as well as compatible alternatives. 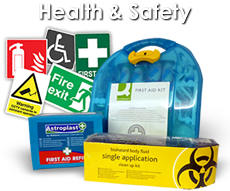 Our health & safety supplies cover a wide range of products from accident report books, first aid kits, fire safety equipment and personal safety alarms. We also sell signs/posters for safety issues such as fire, first aid location, smoking, traffic, safety warnings and more.